beta-Sitostanol is a plant stanol often found in small amounts in plant oils and is the fully hydrogenated product of betasitosterol. 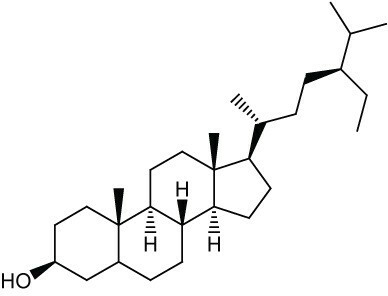 1 Plant stanols and sterols have been used extensively in humans to attempt to lower cholesterol absorption and treat certain cancers.2 When plant sterols are consumed by animals in large quantities they can be absorbed by the gut leading to a dysfunction of metabolism and resulting in sitosterolemia, a high plasma plant sterol concentration, but stanols are not normally absorbed and are therefore preferred as cholesterol lowering agents.3 Plant stanols and sterols are important components of plant cell membranes and have a particular role in the plasma membrane, mitochondrial outer membrane, and endoplasmic reticulum. Plant sterols will complex with glycosphingolipids in raft-like sub-domains and can affect many cellular functions including membrane fluidity, permeability, activity of membrane-bound enzymes, cellular differentiation, cellular signaling, and cellular proliferation. They can be esterified, glycoslilated, and acylated to form steryl esters, steryl glycosides, and acylated steryl glycosides. Sterol esters are usually found only in small amounts naturally while sterol glycosides account for most of the common plant sterols.